The shedi connection. – Dirty wet dog , boats and sailing. My main job last friday was to source the worktop/counter-top that we would fit over the pre-built bathroom units. I really didn’t like the 3 standard tops offered by the manufacturer and i knew that what i really wanted was something in hardwood, preferably oak to go with the exposed beam and really preferably something a bit rugged looking. The day turned into a bit of a dirty/shaggy wet dog story in that i thought i knew where to go for a good looking oak board as i also knew that the one reclamation yard i have used doesn’t have any in at the moment. That entailed a drive out over the moor on a filthy wet day and HMP Dartmoor looked particularly grim in the low cloud and driving rain. Anyway after a bit of a search where i thought the traditional woodshop was i found that they hadn’t just moved but subsequently shut down. My second choice was to just order up a piece of oak through the boatbuilding industry but in that case i wouldn’t have been able to chose the board. By chance i dropped in at the bathroom shop to see if they had any ideas and they said to go and take a look at the other reclamation yard that i didn’t know existed locally. About an hour later and we were heaving an 80kg and 40 years air dried chunk of English oak up onto the roofbars of the Pajero, got that home and the look on Matt the plumber’s face was absolutely priceless as the board was huge, gnarly, rough and warped….exactly what i wanted to start with. Now the first connection is that my partner had accidentally met a chippie by dint of looking after chippie senior in her job at the hospital….knew roughly where his workshop , so we go straight around there to find the place. As it happened we walked into the wrong workshop , had a quick chat with 2 blokes that rebuild Airstream trailers in there for a living and then went through into Adams shop which is part of the same big shed. Adam the chippy didn’t seem at all fazed that i really needed this job turned around quickly but i guess its the case that my job is one that he can do a bit of as a filler between bigger jobs : he was going to have to cut and re-glue my huge rough board and then plane it down to a nearly flat surface before we can get the actual worktop out of it. As soon as we know exactly what the finished dimensions are going to be Adam will rout out the basin cut-out for us as i know that none of my tools would touch it, i think its going to look great and totally worth the effort of going to find the wood and the person to do the work. 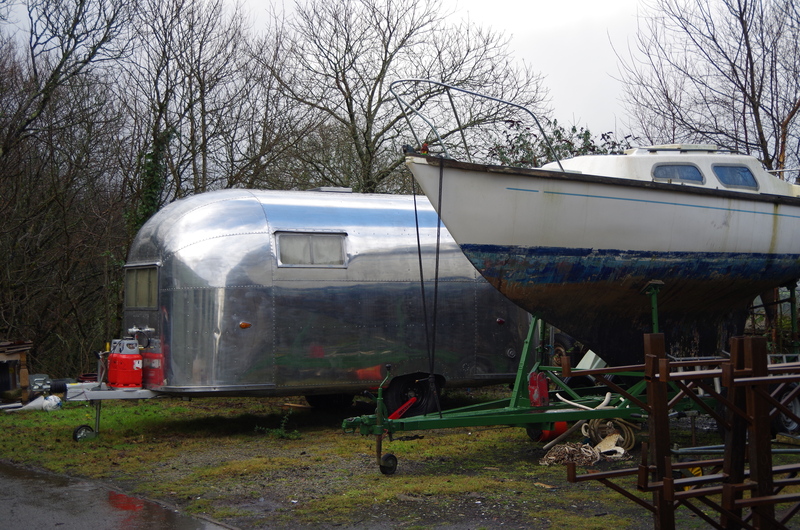 Now : as much as i love Adam’s workshop its the one next door that i want to do a cover on for the blog because that’s where they rebuild and refit the ‘land-yachts’…..aka airstream trailers…..don’t even dare call them caravans. Just as a taster here is the office in the corner of the workshop that is modelled on the end of an airstream trailer. That post will have to wait until they have time to tell me a bit about the work they do, as i understand it they are booked up about 3 years ahead for total refits of the trailers and the cost of doing that is just about the same as doing a custom boat refit. Previous Antisocial media and the last Shedi.